Some people I met ask this kind of question. "What do you think if one day only one spoken language is spoken in the world?" "What if it is not your mother language?" which is signed as spoken Japanese. WHY? Why sign language is not universal? 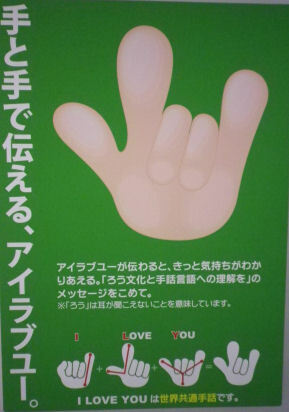 I think like spoken lanauge, sign language also reflect thier cultures and societies. Every langauge developed in several places in the world! so sign langauge in the U.S is more similar with French one than British one. It is like tsunami from Japanese isn't it? People will understand you across the border. we all come from different countries or prefectures and different cultures. just beause they come from the same country or they speak the same langauge. not only their countries or university name, but "WHO thay are"